Here are five points I picked up from the game that means jack-nada for the bunch of us reading it. Enioy! The Atlanta Falcons defense, composed of a fiery group of world killers all young enough to be denied a car rental, is probably going to be a pretty good unit this year. Last year, they were a not-so-great unit with some great players until defense wizard Dan Quinn came in and squeezed every last bit of talent out of the group with his astute play calling. This year, it’s easy to fall into the trap to think the Falcons will have a top-5 defense. But that doesn’t mean they won’t be pretty darn good. Just look at Saturday’s performance – Grady Jarrett continues to look like a raging bulldozer when he presses from the interior. Rookie Takk McKinley is already flashing his speed and general relentlessness. New DL guy Jack Crawford ate like a king against Arizona’s offensive line group. Adrian Clayborn looks healthy and spry. The defensive line might be as talented as it ever has been since many of us have followed the team. They’re going to be able to draw up pressure this year, maybe even on a consistent basis. That’s huge. The linebacking core looks better. They’re fast, fast, fast, and Deion Jones looks like he could have a Pro Bowl season waiting in the wings. The other guys – De’Vondre Campbell, rookie Duke Riley, special teamer LaRoy Reynolds and rookie Jermaine Grace if he sticks – are all talented enough to give the team a lot of hope for how the front seven is going to perform this year. It’s not an elite group, but it can grow into being a really solid one. Jones is the marquee name, and he’s as talented as they come. The secondary right now? Well, corner depth is admittedly shaky with Jalen Collins out, but with Desmond Trufant and Robert Alford, they’re going to be just fine unless one of those guys get injured. If one of those guys get injured, it’ll be a little nerve-wracking. Ricardo Allen and Keanu Neal are going to have a lot of fun banging heads together, like they did Saturday. I don’t know what the ceiling is for this group. The linebackers give you a little pause because of their youth. They’ll make an incredible play one moment, and then they’ll let up a big run or catch on another play. Just how it goes as guys develop. Consistency makes the unit – is Atlanta there yet? We’ve got 16 (hopefully plus) games to see. The offense finally showed that during preseason, teams try things out, it doesn’t always look pretty, you don’t always score and life goes on. Seriously, do you think they’re going to score every time they touch the ball this season? There are a few popular guys on the roster bubble right now that we’re all interested in – here’s an update. Marvin Hall Jr. – Has had his ups and downs as a receiver, but continues to flash on special teams. The likely frontrunner for the WR6 spot, assuming there is one open. Reggie Davis – The best chance for the Falcons to field a Bulldog since Akeem Dent. He’s made big plays all through preseason, and got more looks against the Cardinals with the first team offense than Hall did. But, special teams reps win the day, and Davis is looking like the next popular preseason receiver to be left off the 53. Practice squad looks like a good bet. J.T. Jones – He’s done a good job, but the defensive line is so deep. Brooks Reed is the only guy he could really replace, though Reed right now is the better player. If the team is ready to part ways with Reed’s contract, it makes sense to keep a guy like Jones (or Chris Odom, who is technically ahead of him on the depth chart and has been just about equally as impressive). If not, Jones could be a Capi in the making. Jarnor Jones – Jones has flashed at times this preseason. He could make the roster as insurance for Jalen Collins, though the practice squad feels safer. Blidi Wreh-Wilson will likely cling to that sixth cornerback spot. Quincy Mauger – Probably practice squad. If the Falcons have two Bulldogs on the roster, will that make the Georgia fans happy? Or will Arthur Lynch will be avenged? Five Guys Burgers and Fries you’re overlooking, don’t be shocked if they stick around on the practice squad. RB Brian Hill exited the game Saturday and did not return with an injury, while backup MLB LaRoy Reynolds left the game with what is described as a chest injury (possibly pectoral). If Hill misses multiple weeks, the team could feel obligated to put him on IR for his first season and give him time to develop for 2018. Terron Ward has beaten him for the third RB job fair and square, though Hill obviously has a role with this team in the future. We just may not see him fill that role until 2018. Reynolds is a little trickier – he’s got a clearly-defined role on the team as Deion Jones’ backup and as a special teams ace. If he misses any significant time, the team has an exact decision to make. UDFA LB Jermaine Grace could be this year’s Brian Poole – he’s really looked sharp in his two preseason games and has gotten reps with the first team. Even if Reynolds is healthy, he’d be a good bet to make the roster. Right now, he’s the favorite, but even with him there, you still think the team would want a little more experience. 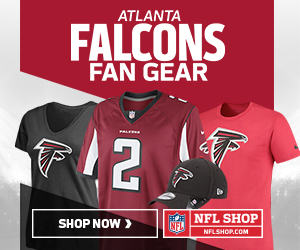 Just in case you need this for a Falcons fan trivia contest one day. Matt Simms through the pass.